This Valentine’s Day, I finally had the opportunity to experience the aerial photography of Edward Burtynsky at the Grand Rapids Art Museum. A 2005 TED prize winner hailing from Canada, his work has captivated me since early high school. First with a fascination for Ansel Adams and Nadav Kander, my appreciation for Burtynsky grew as our environment began to fatigue. From Iceland to India to Portugal, his snapshots of quarries and shipyards both frightened and inspired me, and made me feel small against the aging earth. But it was the documentary Manufactured Landscapes, shown at the 2007 Sundance Film Festival, that stunned me with the reality of our transforming scenery. For there was a truth to be told not only in his photographs, but also in the stories he had to share. 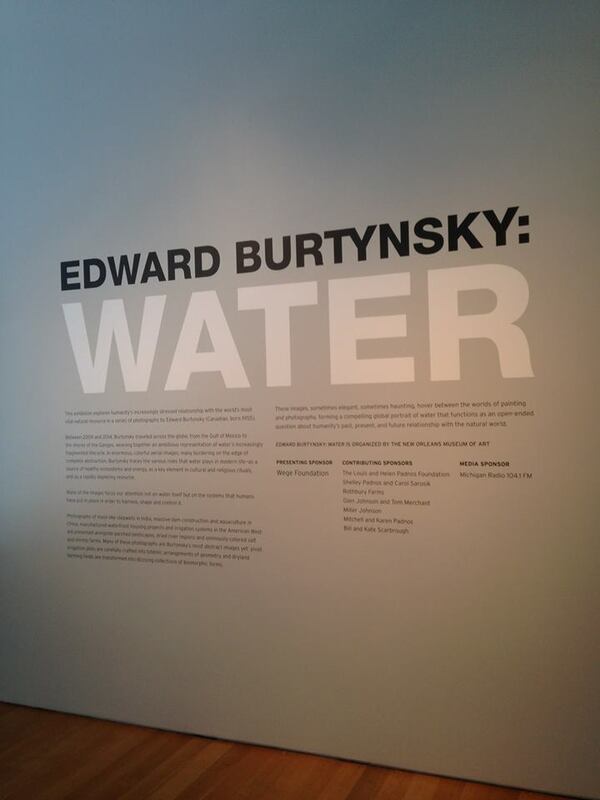 Thus seeing his work with water this weekend was not only prolific, it was eye-opening. I highly recommend visiting his exhibit at the GRAM if you are in the city, where you can begin to appreciate worlds undiscovered by many of us here in West Michigan. And, not only can you do this for the sake of sustainability, but for the beauty and symmetry that can be found in the most unusual of places. This entry was posted in Art, Grand Rapids, Michigan, Photography and tagged Edward Burtynsky, enviroment, Grand Rapids, manufactured landscapes, Michigan, photography, Sundance Film Festival, sustainability, TED prize, TED talks, The Grand Rapids Art Museum. Bookmark the permalink.